Forget spending the big bucks, try the less expensive option and make them your own. 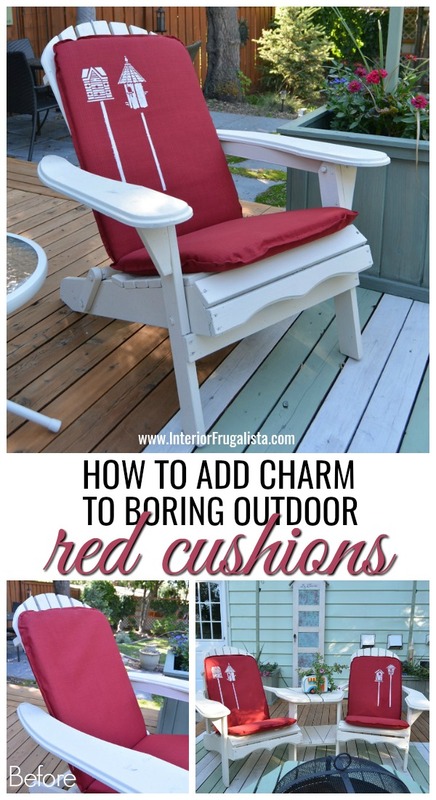 It's so easy to add charm to boring outdoor red cushions, or any color for that matter. In less than ten minutes you'll have one-of-a-kind outdoor cushions and no one will know you paid discount prices. 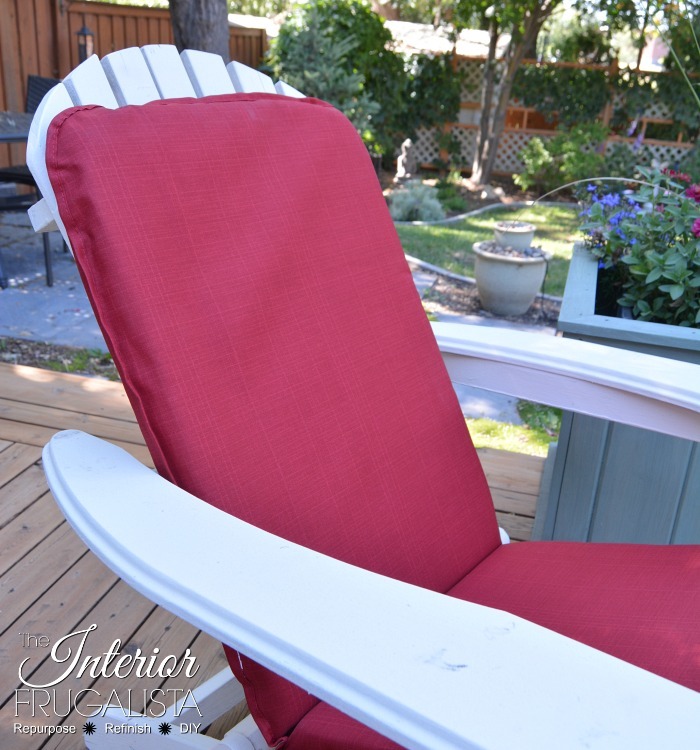 I spent weeks shopping for outdoor cushions both online and at local retailers for our refreshed Adirondack chairs and tete-a-tete. I soon learned they would cost a small fortune at $49.99 per chair - not going to happen. 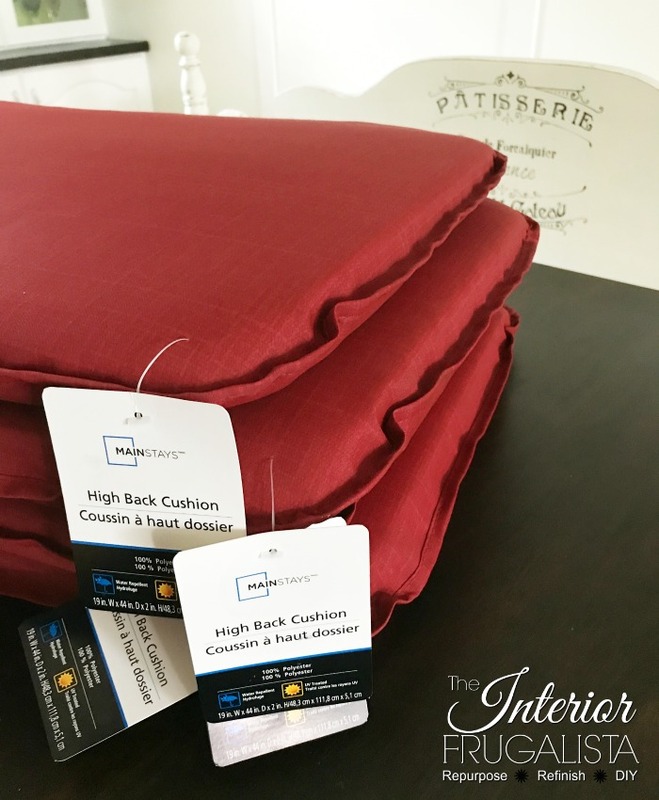 Shy of sewing my own, I had to come up with a way to get the look for a fraction of the cost and I found it at WalMart. They had these high back outdoor cushions for $19.97 each. 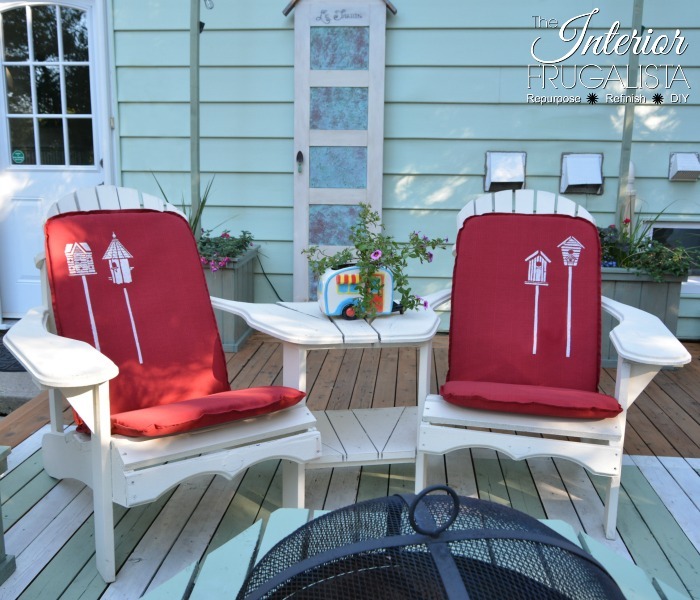 While not officially "Adirondack" chair cushions, they were very similar in size and shape to the real ones. 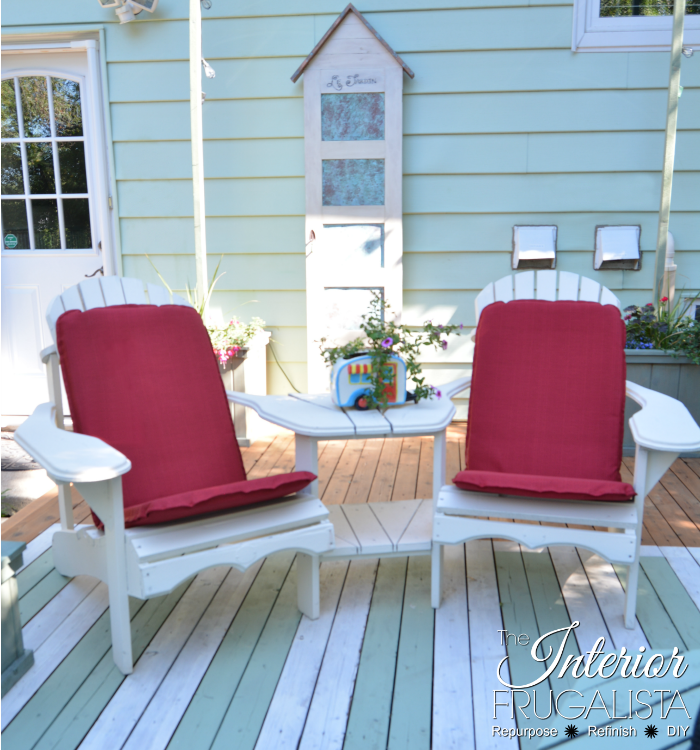 Unfortunately, the colors and patterns available didn't work with our new deck makeover BUT they did have them in solid red. 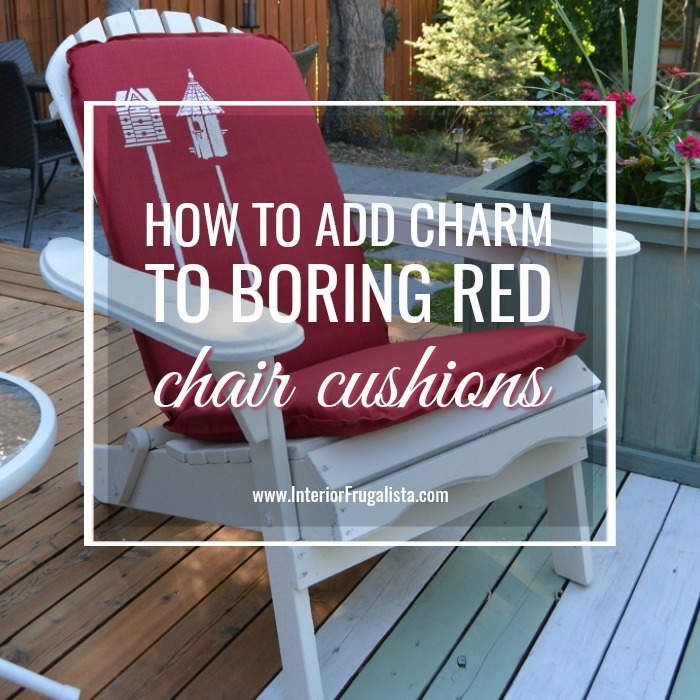 The red certainly works with the soft seafoam green we are using in this space but I find the cushions rather boring. And then I remembered a birdhouse stencil I bought at Michaels in the Spring. If you've been following our beer-budget deck makeover series, you know that we have a bird theme going on. What doesn't go more perfectly than birdhouses! 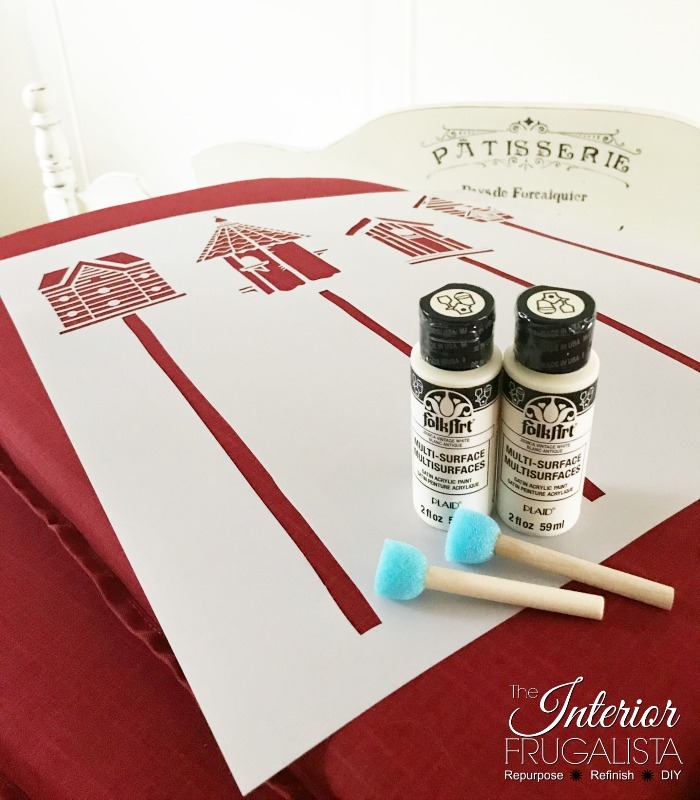 These are the supplies I used for stenciling the red cushions. I've included a Materials List at the bottom of the post. 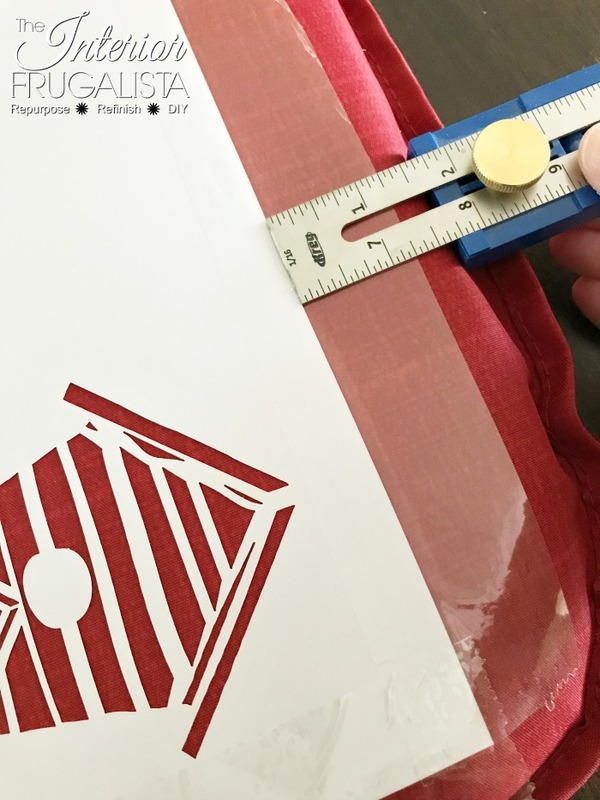 To ensure the stencil alignment was uniform on each cushion I used my handy Kreg Multi-Mark Measuring Tool, I love this thing! 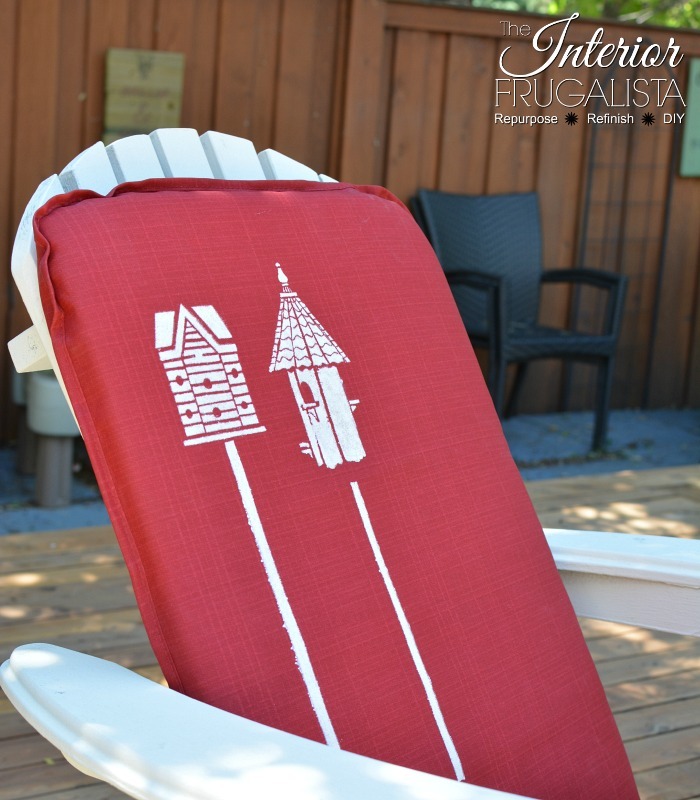 Stenciling on fabric is not difficult but with cushions inside, it can be a little tricky because the fabric slides easily over the water-resistant outdoor foam. I tried using painters tape and masking tape first to hold the stencil in place but the best tape ended up being packing tape. I didn't attempt using spray adhesive in case it stained the fabric. 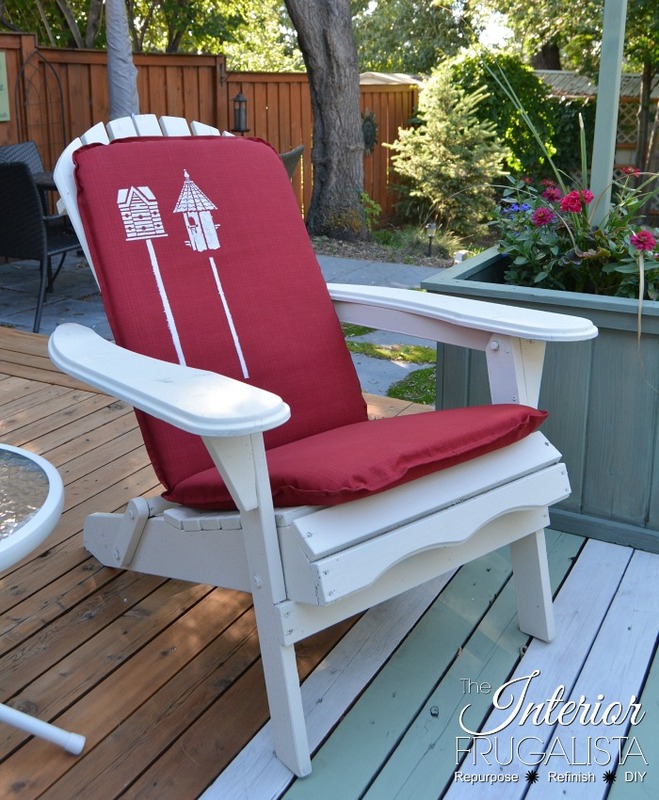 This is such a quick and easy way to dress up simple cushions and took me all of ten minutes to stencil all four. I resisted the urge to use the full stencil centered onto each cushion because I find asymmetrical design much more pleasing to the eye. Normally I'm a swirler stencil kinda gal but with how easily the fabric moved over the cushions, I used the dabber technique instead. First I tried using a foam dabber but found it absorbed too much of the paint so I used my favorite round tip stencil brush and lightly dabbed the paint in an up and down motion. Stenciling is normally a dry brush technique where you remove most of the paint onto a paper towel. But I found with this paint it applied better by dipping the brush into the paint and removing just a bit of the excess paint so the brush was still wet but not too heavy with paint. 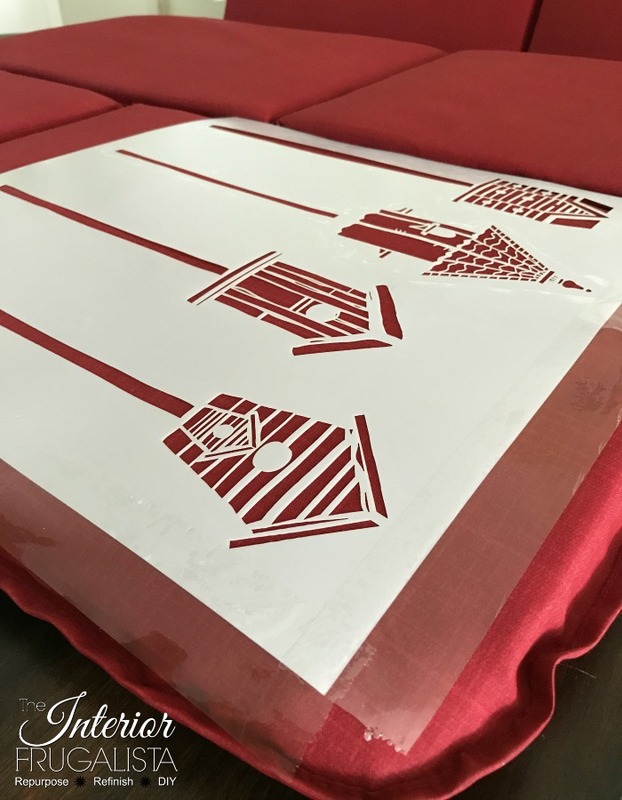 It also helped to hold the stencil firmly against the slippery fabric with my left hand while I worked - not too firmly where it condensed the foam. There was a little bleed, most likely because I had too much paint on the brush, but not too bad considering. As promised, here is the materials list. It contains affiliate links for your convenience so you can see what products I used or recommend to make this project. What that means is that if you click on one of the product links and make a purchase, I may receive a small portion of any sales at no additional cost to you. See my full disclosure policy. 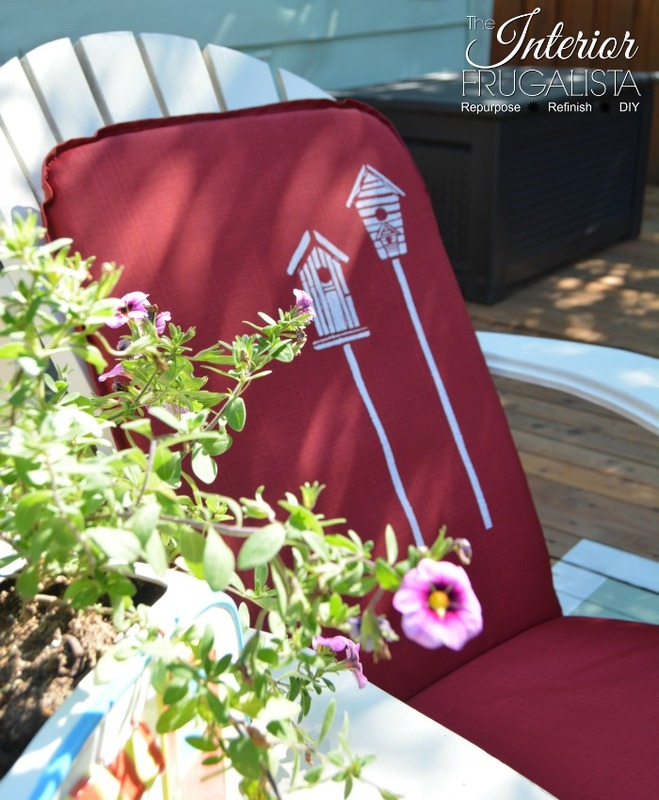 While I wonder if I should have stenciled all four birdhouses on each cushion, I do like the simplicity of the asymmetrical look. What do you think? I'd love to get your feedback in the comment section below. I REALLY like what you did! In my own ineptness, I would have done 3 on a slant, but that would have destroyed the asymmetrical-ness of it all. Good job!